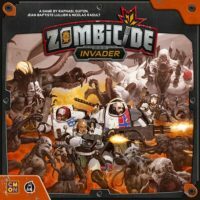 Zombicide: Invader is a standalone cooperative board game for 1 to 6 players, taking the trademark Zombicide action into the far reaches of space! Players control a group of Survivors trying to defend their remote mining outpost from a swarm of infected aliens controlled by the game itself. The more experience and power the Survivors earn, the more Xenos invade the facility! This sci-fi interpretation of Zombicide is as sleek as ever, playing fast and furious. The rules have been optimized to reduce setup time and make the game flow quickly, focusing the action on the struggle between the Survivors and the Xenos. Game should be released in 2019 Q3, so watch the news!